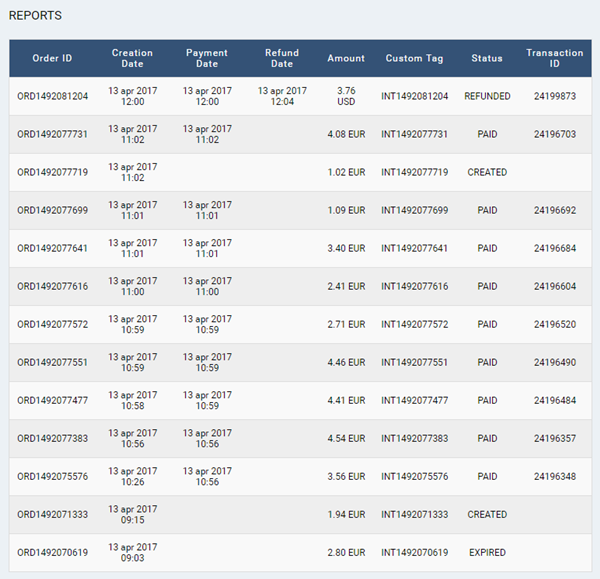 In the web menu, choose Reports in order to view and download data for the orders created in your e-shops and paid with Moneymailme. Note: Go to the Before you read further section to understand more about orders and their statuses in Moneymailme application. Select the orders for which you want to consult data in the field Report type. Select the e-shop for which you want to consult data in the field Select your shop. Click on Show report once done. Note that this section contains a list of orders, not a list of payments. Go to the Download Reports section to download data (in .csv format) since the beginning of your chosen e-shop existence or to download data (in .csv format) for a complete month (the previous one). The downloaded .csv file contains the following information for each order: shop ID (as present in the technical implementation section of your create M3 e-shop), order ID (as assigned by Moneymailme system), timestamp when order was created in Moneymailme system, timestamp when order was paid by a Moneymailme user, (if the case) timestamp when order was refunded to a Moneymailme user, amount of the order, currency of the order, custom tag (as assigned by your e-shop’s system with data for your own reference), status of the order (created, paid, refunded or expired), (if the case) refund reason of an order returned to a customer, (if the case) ID of the transaction that paid the order, (if the case) ID of the refund transaction when an order has been returned to the user.